The bass bite has been very good as of late, with breaking fish all over the main lake areas. The best action has been coming off of fly-lined flukes, either dead sticked, or skipping them on the surface. It is imperative that you put it right on them, and you will be rewarded with 3lb. average fish! In the middle of the day your best bet is drop shotting 4" worms in 25' to 40' of water once again in main lake areas. There were no panfish, or catfish reported to the concession last week. 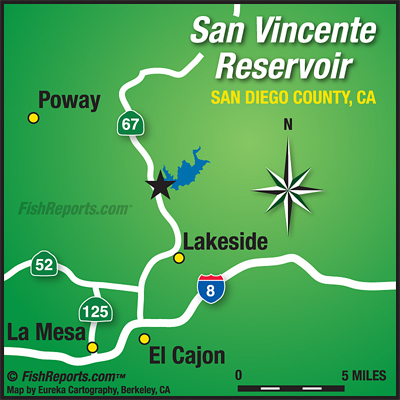 Also as of now, there is body contact allowed on Sundays only, so the toll road and Barona arms are open to fishing 4 days a week.